I know that R2-D2, the little astromech droid that could, and did in fact, play an extremely crucial role in the Rebel Alliance striking at the heart of the Galactic Empire before, is also a little bit domesticated. What do I mean by that? Well, it might be able to get out of tight spots against other droids that are far larger and more powerful, but it is also a decent hand in the kitchen. 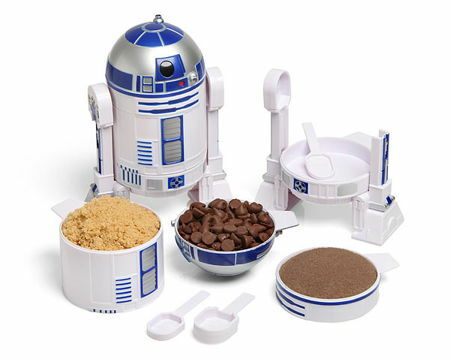 Case in point, this $19.99 Star Wars R2-D2 Measuring Cup Set. The Star Wars R2-D2 Measuring Cup Set, as its name suggests, will feature an entire set of measuring cups that resemble parts of R2-D2. In fact, its whole body is built from a quartet of measuring cups: 1/4, 1/3, 1/2, and 1 cup. You will not be able to find this anywhere else, as it is a ThinkGeek creation and exclusive, and has also been officially licensed by Lucasfilm to roll off the production lines. The detachable utility arms can be used as nested measuring spoons of 1/4, 1/2, 1 tsp, and 1/3 tbsp, while the dome itself is both 1/2 cup and 1 tbsp. It might be able to withstand a laser shot or two, but this R2-D2 is extremely averse to being placed in a microwave.